I’m on a quest this Summer to slooow down, enjoy the outdoors more, spend more time with God and my family but still feed my family delicious food! So I’m starting a once a week series of Crock Pot recipes and a short devotional! I’m starting out with this simple Crockpot Mongolian Beef recipe that is a family favorite! 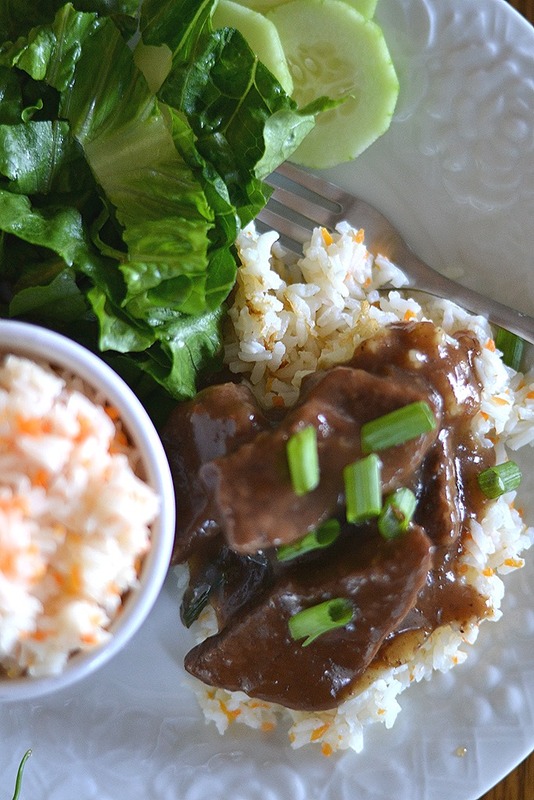 You can also check out some of our other Crockpot Dinner Recipes that are family faves! 4 Please hop on over to this page for todays SLOOOW COOKIN Devotional! I have to admit that I don’t utilize my Crockpot near enough! I usually use it for cooking in bulk and freezer meals or family get togethers and such. Here’s a little secret too… I don’t really like a lot of the Crockpot/slow cooker recipes out there and neither does my family…sooo I’m committed to bringing YOU and my family the very best Crock Pot recipes in the next few months! Not only that, my BIG COMMITMENT for the Summer is to rest, spend time with my family, have more fun and spend more time with God! We are calling it The Feast! Along with yummy Crockpot recipes, I’m going to sharing a weekly devotional that I hope you can use in your journal journey! 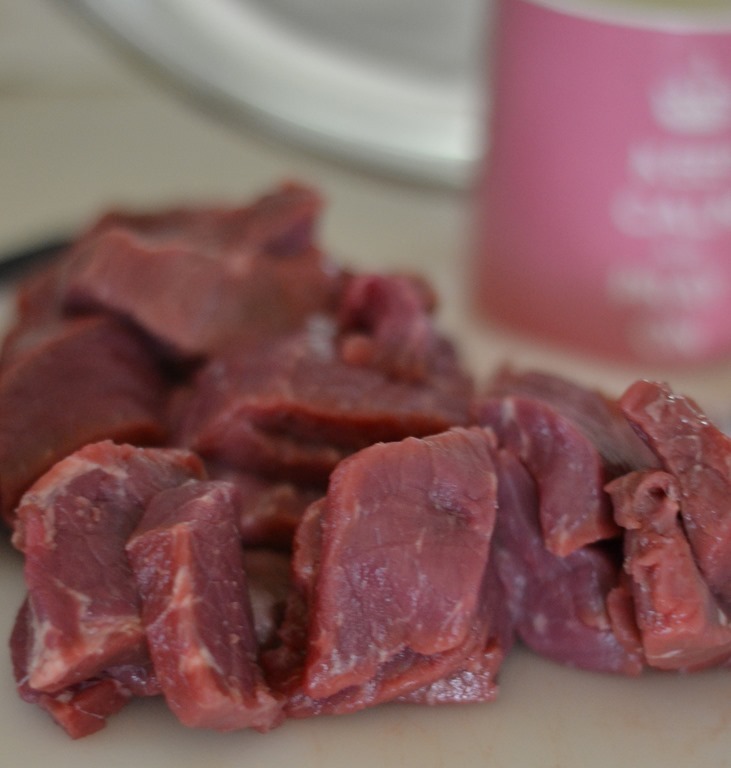 First off I just have to say that MOST recipes call for flank steak, that is why I have it in the ingredients, BUT I rarely use flank steak as it is soo expensive! Food fact: London Broil is the same cut of meat as flank steak! Yep! Personally I think that London Broil is PERFECT for these kinds of Crockpot recipes. Cut up your choice of meat. 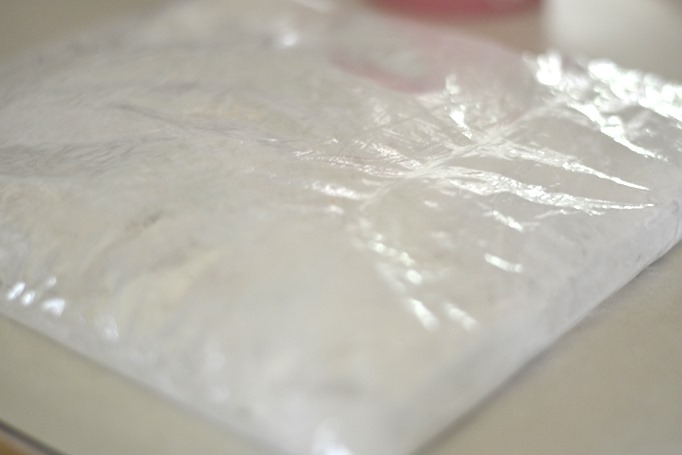 Put into a ziplock bag with cornstarch. Shake up to coat all pieces. Set the meat aside for 10 min to let rest. While the meat is “resting” Mix together ~ Soy Sauce, water, garlic, minced fresh ginger and brown sugar. 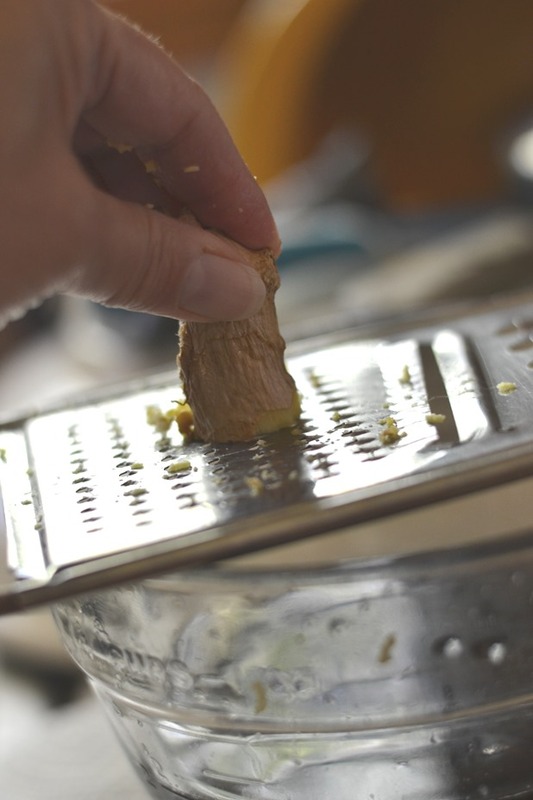 For fresh Ginger, you simply peel off tough outer skin and then grate. SPRAY your slow cooker with cooking spray…easy clean up. Then add meat to slow cooker and pour sauce on top. That’s it! Now I don’t add my veggies until there’s about 1/2 of cooking time left. That’s because I don’t want mushy veggies. If you want to add your veggies all together from the very beginning…it is perfectly fine…they cook down and the fam will never know they were even in there! HA! Cook on low for 4-5 hours or high for 2 1/2 hours. You may want to check about 1/2 before cooking time is done. Due to different kinds of slow cookers and varying temps., you’ll want to check and see if the thickness of the sauce is where you want it. If it’s thicker than you want, simply add a 1/2 cup water at a time until you have the desired thickness. Oooh and if you would like to Pre Prepare this meal for a freezer meal that you can serve later…simply do all of the above, but instead of putting into the Crockpot, put ALL ingredients into Ziplock bags and freeze for later. When you are ready to use, simply unthaw completely and add to Crockpot and cook! Please hop on over to this page for todays SLOOOW COOKIN Devotional! Check about 1/2 before cooking time is done. Due to different kinds of slow cookers and varying temps., you’ll want to check and see if the thickness of the sauce is where you want it. If it’s thicker than you want, simply add a 1/2 cup water at a time until you have the desired thickness. I don’t add my veggies until there’s about 1/2 of cooking time left. That’s because I don’t want mushy veggies. If you want to add your veggies all together from the very beginning…it is perfectly fine…they cook down and the fam will never know they were even in there! « What if I’m Just an Ordinary Girl? 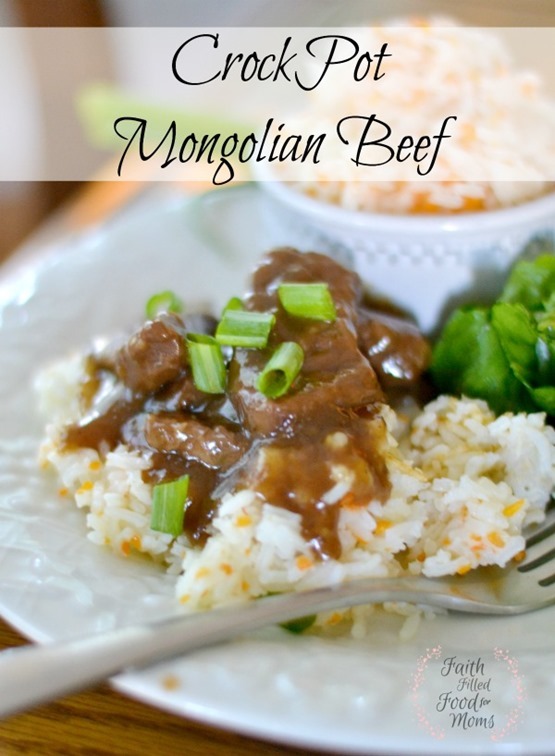 I have been looking for a Mongolian beef crockpot recipe! YES!! I will def give this a try. Thanks!!! You are so welcome Andrea!! This recipe is so easy and if you use the London Broil, it’s much less expensive than Flank Steak! Either way it’s yummy!! Thank you for stopping by! Hi Naomi! Thank you so much for taking time to stop by! I hope you and your family enjoy…it’s just so easy! 😀 Blessings to you!